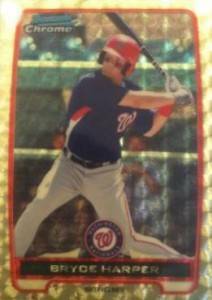 The 2012 Bowman Chrome Bryce Harper Superfractor has surfaced on eBay. While it may not have the same prestige as his earlier Superfractors, it's still getting lots of attention, and bids, from collectors. Ending on Tuesday, the Bryce Harper Superfractor currently sits at $3,300 based on 28 bids from 16 different bidders. The card comes from the recently released 2012 Bowman Baseball. With the somewhat ambiguous title, "bryce harper bowman chrome superfractor 1/1 WOW!" it could lead to a potential bargain as doesn't draw much attention to itself. It's also not very clear, not being up front about the card's year. This is the second Bowman Chrome Bryce Harper Superfractor to pop up on eBay in recent weeks. The 2011 Bowman Chrome Bryce Harper Superfractor ended early earlier this month. All bids were cancelled beforehand. Just a couple of weeks earlier, the same card was listed on eBay but ended up being sold offline. Graded 9.5 by BGS, the 2011 Bowman Chrome Bryce Harper Superfractor will likely remain the most iconic. The first Bowman Chrome Bryce Harper Superfractor is from 2010 and pictures the outfielder as a member of the USA Baseball team. It sold in October, 2010 for $12,500. A 2011 Bowman Platinum Superfractor featuring autographs from both Harper and Jameson Taillon is also being offered on eBay with a Buy It Now price of $2,600. Although Bowman Platinum doesn't carry the same clout as the Bowman Chrome brand, the fact that the card is signed still makes it stand out from other Superfractors. The 2012 Bowman Chrome Bryce Harper Superfractor is the latest to turn up for sale on eBay. Other high-end 2012 Bowman Chrome Superfractor sales include autographs from Dante Bichette Jr. ($2,500), Tommy Joseph autograph ($1,535) and Eddie Rosario ($1,499). The teenaged phenom continues to bring a lot of attention to the Washington Nationals and baseball in general. While Harper's batting average has dipped, he has still been involved in several dramatic moments. Through 20 games, the first overall pick in the 2010 MLB Draft has 17 hits, two home runs and five runs batted in. Harper's first official rookie card arrives as a short print in 2012 Topps Archives Baseball, which is officially released on May 23. Bryce HARPER $$ ROOKIE Card RC Bowman Platinum Baseball RARE Washington NATS! 2012 Topps Factory Set Fenway Dirt (660 Cards) w 2 Bryce Harper RC's! Nice! 2017 Topps Chrome Bowman Then & Now Bryce Harper on Card Auto 25! BGS 9.5 10! !